An application developed for both the Apple iPhone and the Apple iPad, Mobile World Live, has now been released through the official iTunes App store by the GSMA. According to the product description, “The App that will serve as the voice of the mobile communications industry, and will extend the reach of the industry’s elite events.” The app has been released in time for the GSMA’s Mobile Asia Congress show to be held on November 17th-18th 2010 in Hong Kong. The app can be downloaded for free from iTunes by searching for ‘Mobile World Live’. The application offers a mixture of news, videos and discussions. 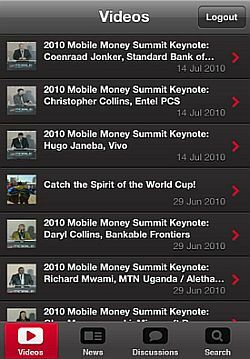 On Apple’s ITunes App Store, the screenshots showcase the videos which the GSMA has made available from its recent Mobile Money Summit 2010. There seems to be no official announcement about the iPhone app yet, either on the Mobile World Live web site or on the official Mobile World Live pages on Facebook. A quick trawl on the Android Market, Blackberry App World, and the Nokia Ovi store revealed no application similar to the iPhone app. Gosh, the GSMA’s development team must be getting brave if they risk offending those three market sectors.